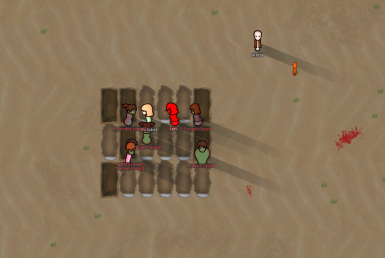 View the release thread on the Rimworld forums. challenges to the game when fighting them. - Zombies are mindless killers. They kill you and your enemies indiscriminately. into a zombie immediately on death. - They are 20% slower than colonists and other enemies, and can be easily killed with Cutting weapons like knives and swords. colonist there will be a pair of "*"'s surrounding their name. - The Zombie Infection will affect any limb that is bitten by a zombie. This can be seen in the Health tab. 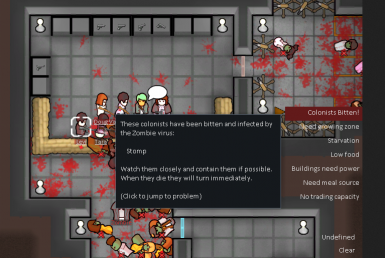 - Removing infected limbs will cure a colonist of the infection. - Zombies attack in large numbers. 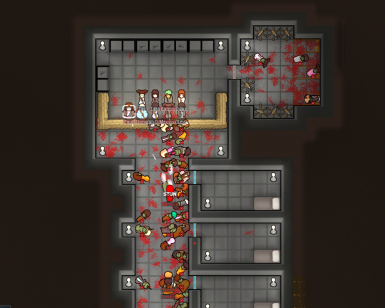 - Zombie hordes always attack immediately. to deal with them after the initial zombie attack is over. - Zombies do not give up or flee. - This incident never ends. Once the virus goes airborne, everyone is infected.